At GROUNDFLOOR, we’re committed to doing everything in our power to ensure our borrowers’ projects are successful, which in turn drives value to our investors. In a previous post, we highlighted this commitment by examining a case study of how our Asset Management team handled a problem loan to ensure a satisfactory resolution. Today, we wanted to showcase another area in which GROUNDFLOOR is constantly working to the benefit of all our customers: ARV estimates. The ARV, or after repair value, of a property is essentially the projected value of a property after it has been repaired or flipped. Translated, the ARV is roughly the price you’d expect the property to fetch in its new and improved condition. As such, the ARV is a crucial piece of information for flippers to obtain as it helps measure whether or not there is enough margin for the renovation project to become profitable. Additionally, when a borrower is going through the lending process, having as accurate an ARV estimate as possible is beneficial because it helps inform the terms of the loan (interest rate, etc.). Finally, having an accurate ARV estimate is helpful when planning out a given project's budget and scope of work. Accurate ARV estimates are valuable for our investors as well. As noted above, ARV estimates help inform the terms of the loans (specifically, the interest rates, risk factors, and loan grades) we give and subsequently offer up for funding on our platform. Our investors then use this information to make decisions about where to put their money. Additionally, consistently having ARV estimates that match closely to the final selling price helps give investors on our platform confidence that we are knowledgeable in the local market and are providing accurate risk assessments on the amount of leverage against any particular project. When a borrower approaches GROUNDFLOOR for a loan for their proposed project, they present us with a detailed scope of work along with their estimate of the home’s ARV. This estimate is primarily based off of that borrower’s intimate knowledge of the community and the market trends where they work. Then, GROUNDFLOOR contracts an independent appraiser to obtain a second ARV estimate. This second estimate is backed up by comparable properties in the area, the appraiser’s years of experience and knowledge of the market, and other relevant data. 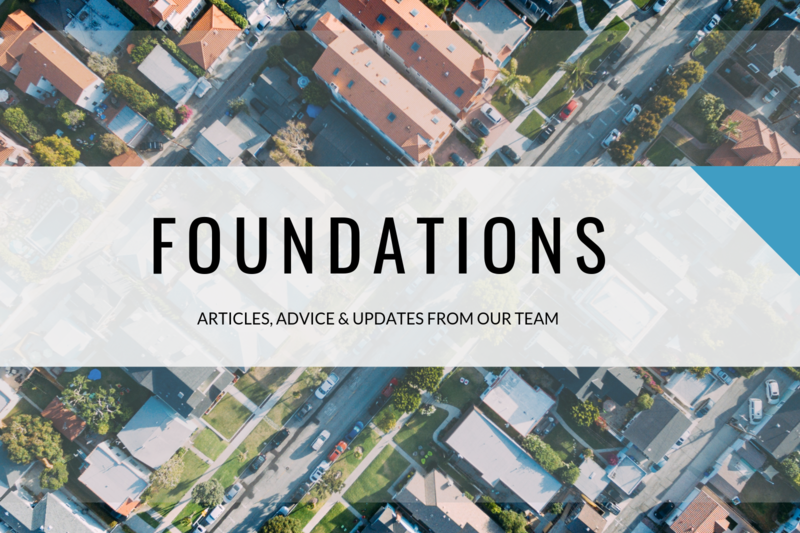 GROUNDFLOOR’s underwriting team then uses all of this knowledge, plus data from even more comparable properties, to reach a third and final ARV estimate that’s known as the reconciled value. This is the value we use to assign a grade and interest rate to the loan. We recently completed an analysis of all 121 loans that paid off in 2018 via a sale of the property to compare ARV estimates to the actual sale prices of the property. Click on the photo below to be taken to the complete list of data for reference. GROUNDFLOOR’s estimated ARVs were on average 4.6% greater than the appraised values. Relative to the actual sale price, GROUNDFLOOR’s ARV is on average 1.5% low, while the appraisal ARV is on average 3.7% low. Relative to the actual sales price, GROUNDFLOOR’s median value was 4.7% low, while the median appraisal value was 8.6% low. The GROUNDFLOOR ARV estimates have a standard deviation of 0.21949, while the appraisal ARV estimates have a standard deviation of 0.2565. Put simply, the above data indicates that GROUNDFLOOR’s underwriting team is spot on when it comes to accurately predicting the ARV of a given property we’re funding. Not only do our ARV estimates generally reconcile to a higher value than the appraisal ARV estimates, but our estimates also generally reconcile to a value closer to the property’s true value. 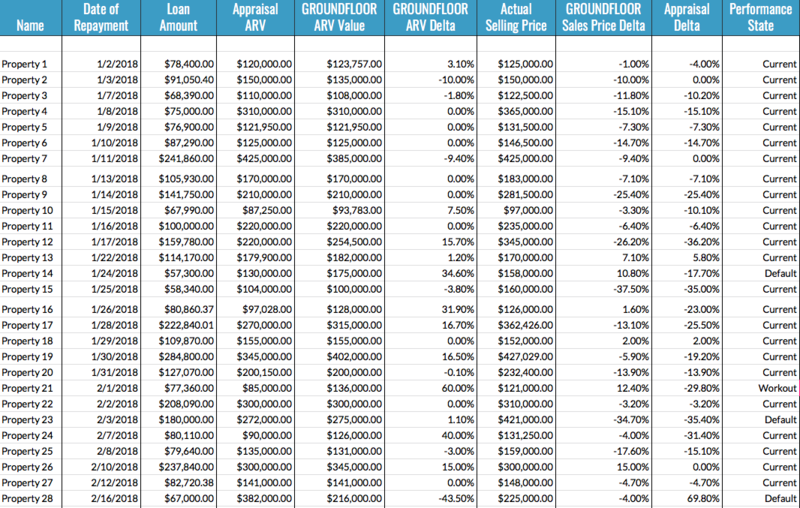 Moreover, GROUNDFLOOR’s underwriting conclusions have less variability when compared to appraisal values. This all spells good news for both our borrowers and investors -- when we’re able to accurately predict a property’s ARV, we’re able to more accurately determine a project’s loan grade and interest rate, which translates to more accurate information for our investors as they make decisions about which loans to invest in. It’s just one more way that the GROUNDFLOOR team is committed to our customers! We hope this has shed some light on our underwriting team’s diligence and commitment to making sure our loans succeed. For more information about other processes we’ve adopted to better serve our customers, we invite you to check out our walkthrough of our asset management procedures. For a detailed overview of the performance of our loans, please refer to our most recent diversification analysis. As always, we welcome your feedback, questions, and comments. Feel free to drop us a line in the comments below or reach out to me directly at rich@groundfloor.us.